We played hard this summer. Our kids are young enough that there isn’t a lot keeping us in Arizona during the summer – so we leave. We travel and we adventure and we explore – and it’s becoming something we all look forward to. When we returned home this summer we had family visiting and then we had a cabin trip with friends. When all that was behind us we had some housekeeping items like dentist and haircuts and school shopping but it was still a lot of play. Steve sent me a text while I was at the dentist with one of the kids. He suggested instead of having yet another afternoon of playing, the kids should do some service. As much as I didn’t want to change plans…he was right. I could come up with a lot of excuses as to why service wasn’t going to work. It’s hard to find something the whole family can do. I had tried arranging something just a week before and it fell through. Service projects take some time and planning and we were far too busy playing to plan anything…which is clearly why we needed to re-focus. We came up with a project that afternoon and the kids were happy to help. 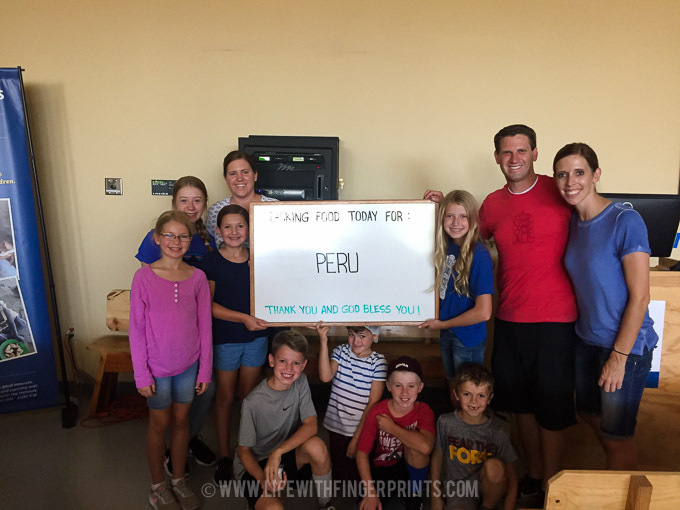 A couple days later we planned to pack food with friends for those in need and when we arrived we learned we would be packing food for people in Peru. Steve served his mission in Peru and has a deep love and appreciation for Peruvians. We’ve packed food at this location many times before and never has it been for Peru – we were happy to be serving that afternoon and felt a little more tied to our service. We needed to serve. Our kids needed to serve. 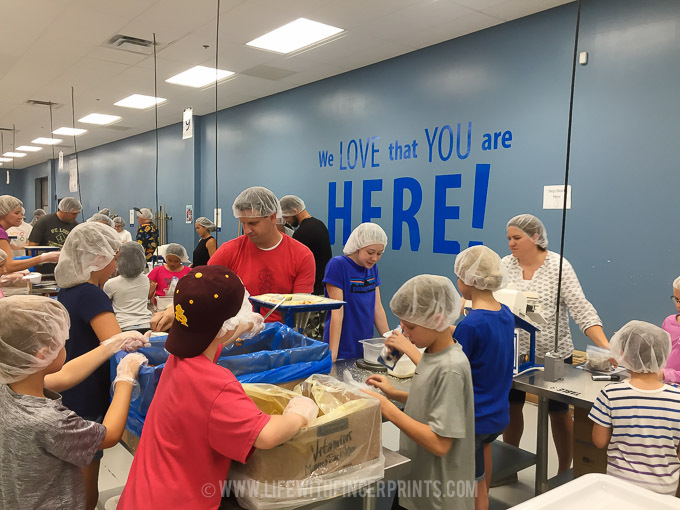 It was a good reminder that we can fill our schedules with all sorts of responsibilities and fun – but we are trying to teach our kids to look outward and I believe the best way to do that is through serving others. And the best way to teach them about serving others is to serve alongside them. We’ve got work to do! My kids are teens and a tween, so it’s easier to find places we can all volunteer. There is usually some grumbling from the youngest, but we all agree it is important and we actually enjoy it for the most part. We’ve chosen 2 places and have committed to volunteering at each place once a month. One prepares meals for families with a member who has a chronic illness (2600+ meals a day); and the other sorts donations for children whose families are low income or homeless. I love the idea of finding a few service opportunities and committing to serve regularly. It doesn’t have to be some new, life-changing service opportunity every month. As long as kids know you’re service minded, they’ll remember that as they grow older and have their own families. Thanks for your thoughts! Thank you for sharing your story! This is a great reminder to serve in our communities and help those around us. Volunteer opportunities are posted, from one time needs to ongoing commitments. I love that you shared the justerve.org resource because I failed to mention that’s where we search for opportunities as a family. In fact the place we pack food is listed on justserve.org!